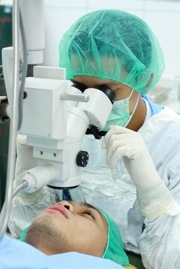 Loss of an Eye | Nashville Personal Injury Lawyers The Law Offices of John Day, P.C. Dealing with vision loss is traumatic enough, but it can be overwhelming when the vision loss is coupled with the physical loss of your eye. Yet, after a severe injury to the eye in a car crash, work accident or some other accident, removal of the eye may be the only option. Fortunately, eye implants have improved and can help with appearance issues. But even with an implant, the injury victim will still grieve the loss of the eye and can suffer with serious emotional issues like depression and anxiety (typically associated with fear of losing the unaffected eye). Medical bills associated with the removal, an implant and long-term follow-up care can be staggering. Lost time from work, and maybe even the loss of your customary job, can cause financial hardships. And, if the injury was caused by someone's negligence, justice demands you be compensated for all of these things. The Nashville Post named John Day one of Nashville's Top 101 lawyers for 2011. If you or someone you love has lost their eye due to someone's negligence, we will put our experience and reputation to work for you. While you focus on recovering from your injury, we will aggressively pursue the at-fault party and protect your rights. We handle all eye injury cases on a contingency basis which means we do not get paid unless we get a settlement or verdict for you. And unlike a lot of lawyers, we advance all case expenses so you do not pay anything out of your pocket to pursue your eye injury case. For more details regarding our fees and how we handle case expenses, click here. If you would like to discuss a potential eye injury claim, please contact us online or call us at 615-742-4880 or 866.812.8787 for a free, no-obligation consultation. The law only allows you a limited time to pursue compensation for your eye injury. So contact us today.